This week has been coffee week in our house, with a fresh purchase of beans from Ventura Coffee and fresh cups brewed each morning. Lucky for us, dessert followed suit thanks to the cupcakes that Toni C. brought into work on Monday. 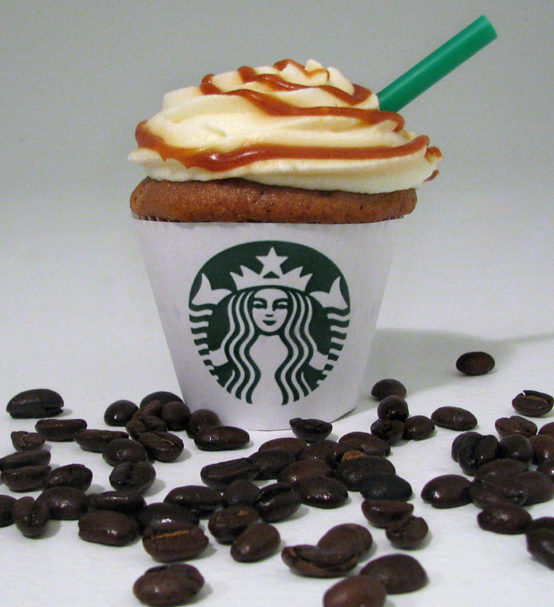 The Caramel Frappucino inspired cupcake starts with a moist coffee and carmel based cake. 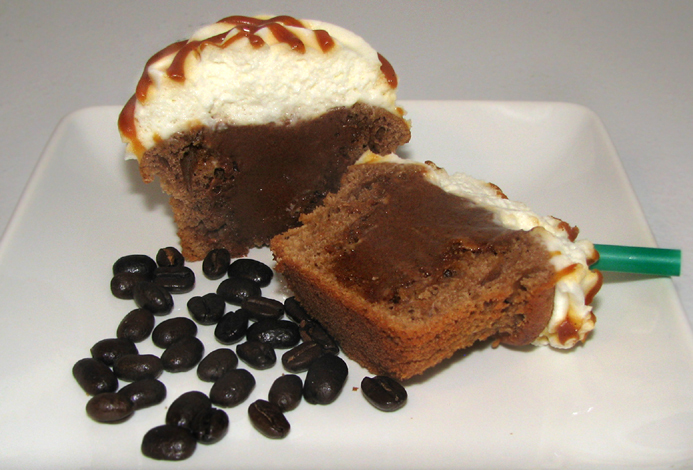 Shove some cappucino infused mousse in the middle and top it with a sweet cream whipped cream and you’ve got a unique spin on the Starbucks favorite, including the caramel drizzle. *The Cupcake Counter features cupcakes and treats created by our friend and Cupcake Fairy Princess, Toni C. All ingredients are fresh and local whenever possible. Finding inspiration in other desserts, cookies, candy bars and fruits, Toni mixes in love and fun to her homemade recipes. – Please note that no cupcakes were sold commercially to the public with the Starbucks logo or conveyed as an official Starbucks product. The logo was for effect in presentation only. Gallery | This entry was posted in The Cupcake Counter and tagged Caramel Frappucino, Coffee, Cupcake. Bookmark the permalink. Hi Jay … I am not a big fan of coffee but I love the game opportunity.